Putin and Erdoğan. www.kremlin.ru/Wikimedia. Some rights reserved.“What experience and history teaches us is that people and governments have never learned anything from history, or acted on principles deduced from it.” (Hegel). Our governments have repeated the same mistakes time and again. They have repented, promised not to fall back into the trap of war and then forgotten all about it, each time with ever increasing precipitation. It has become so routine, in fact, that we should have learned by now not to expect anything different. Wednesday's vote in the British Parliament to bomb Syria demonstrates a perverted, muscle-flexing attitude to war that cannot be simply attributed to short-term memory loss. The mistakes of the past are not there to be learned from. They have become meaningless. Facts and data to be pushed aside and ignored, proving that other interests are obviously at play. It is not just about short-term memory loss, however. Our failure to learn from history has plunged diplomacy and international strategic games back into 19th century real-politik - when the Western powers and the Russian Empire struggled to impose their will and influence over western Asia and the waning Ottoman Empire. Following the collapse of the Ottoman Empire, the Western powers carved up its lands south of Anatolia into countries with no historical, ethnic or religious rationale, ignored the tribal composition of most of the people of the Levant, propped up fabricated kingdoms and monarchic dynasties, and finally sold them an arsenal of weapons large enough to wipe the rest of us from the face of the planet in exchange for fuel. Whenever these governments stepped out of line, our governments and armies intervened to restore political stability in whichever form would secure the interests of our energy sector. This return to a 19th century game of risk is evidenced once more by the return to the scene of two of the past’s main players: the Tsar and the Sultan. The clash between Turkey and Russia is currently being played on two levels: the proxy war on the ground where local Syrian forces battle and are moved as pawns by the hands of their foreign tacticians, while scores of civilians are killed everyday at the hand of criminally orchestrated air-strikes. The downing of a Russian plane by Turkish forces was the inevitable conclusion of this parallel confrontation and has erupted into the other level of this war: that between the bloated egos of Putin and Erdoğan. 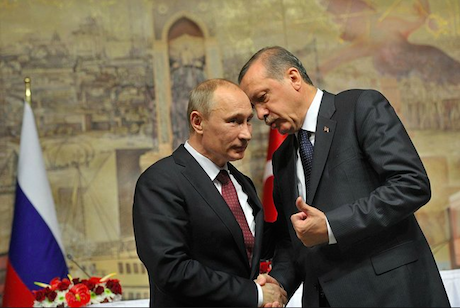 The public show of arrogance of these two men has spiralled into a ridiculous performance of name-calling and accusations, culminated in Putin’s unveiling of Erdoğan’s alleged terrorist ties. The “evidence” which the Russian military purported to show did not prove any direct dealing of Erdoğan, his family or the Turkish government in buying oil illegally and thus financing Daesh. Unless documents and first hand witnesses are brought forward, grainy images and satellite videos hold very little weight. Much more likely, oil is smuggled into Turkey through a number of middlemen who progressively “launder” the oil until it is consumed in Turkey or shipped abroad with other legally acquired oil, while the government turns a blind-eye. All parties involved in the war conduct similar practices, with oil extracted by DAESH being funnelled in every direction, including into Assad's regime, Iraq, the Kurdish autonomy and Iran. Business being conducted by black-market traders between factions openly at war is nothing new. Nor is it something to be particularly surprised about. The latest documents released by the Guardian regarding DAESH’s administrative procedures corroborate this theory. In any case, this clash just goes to show how similar personalities simply don’t attract: the two presidents have so much in common they got on like a house on fire for a very long time. That was until they both started to get burnt. Both wield absolute power over most aspects of their own society, both have usurped the loose institutional balance of power between presidency and government, hopping from prime minister to president and manifesting the clear inefficiency of their political systems to stem individual power. Both suppress media and free speech and both have incarcerated scores of political dissidents, journalists and adversaries. Last but not least, and perhaps most surprisingly for outsiders, both enjoy staggering numbers of democratic support, showcasing that both the Turkish and Russian people have a very serious issue of personality cult and strong-man syndrome. It is precisely for this reason that the egotistic clash between Erdoğan and Putin risks getting out of hand, and becoming a wider confrontation of peoples and nationalities. Russian nationalists and extremists have immediately targeted Turkish citizens living and working in Russia. The police have started harassing Turkish travelers, deporting and sending back visitors and business people alike. Putin was quick to call for order and to state that the problem lies not with the Turkish people, whom he described as honest and hard-working friends, but with the “ruling clique” that governs them. On the other hand, Turkish citizens are growing concerned about the impact that this chest-beating competition will have on their daily lives. It is too early to predict precisely what will happen over the summer, but if the thousands of Russians who usually flock to the southern coast of Turkey are banned from travelling, those in Turkey who rely on tourism for their income will suffer enormously. Such a ban would hit the tourism industry hard when it is already struggling. Similarly, the economic sanctions imposed on Turkish agricultural businesses will hurt farmers and food producers who export to Russia, while trade routes to China will be forced to deviate through longer and more time-consuming roads across central Asia. Turkey's move to accelerate bilateral talks with the European Union in recent days may be seen as part of a further-reaching drive to untie itself from its commercial dependence on Russia, particularly regarding the energy sector. There is no guarantee that Turkey's bid for EU membership will eventually be successful, however. Cooperation so far has focused entirely on Turkey's role in curbing the number of refugees crossing the Aegean Sea to the Greek islands in exchange for €3 billion and looser visa restrictions for Turkish citizens. Unfortunately, the money paid by the EU to Turkey pales in comparison with the losses that the Turkish economy is projected to suffer once Russian sanctions are in place. In fact, the damage to Turkey’s economy is already becoming apparent, with significant losses being shown in November of this year when compared to year on year figures for that month. Nevertheless, neither Putin nor Erdoğan seem too concerned with the impact that their bruised egos will have on their own people. The Turkish president's threat to resign if Russia’s accusations against him were proven shows he clearly pays more attention to pressure from abroad than he does to the will of his own people. The Turkish electorate had initially turned away from Erdoğan’s party in the June elections, only to return to vote for him after months of mounting violence and tension which many at home and abroad labelled as part of a "strategy of tension" orchestrated by the government. Paradoxically, if both leaders continue to play the nationalistic card in this childish blame-game, they might even be able to use this struggle to improve their approval ratings at home by playing on the emotional, patriotic chords of their voters. Neither has any interest in blowing the situation out of proportion, and any military confrontation is completely out of the question: the economic ties between the two countries run deep with Turkish exports to the Russian Federation having grown from $2 billion in 2005 to $6 billion in 2014 (data can be downloaded from the Turkish statistical institute). The consequences of a conflict would simply be too devastating for either party to even consider. And yet, as much as this is a clash of personalities between two inflated egos, the consequences will be felt exclusively by those sectors of the Russian and Turkish economies (tourism, energy, and construction industries, as well as Turkish farmers exporting fruit and vegetables to Russia) who have benefited until now from friendly relations between the countries, and all the people and families whose livelihoods depend on them. Furthermore, it will bring stronger animosity and distrust between the citizens of both countries, acutely exacerbating tensions and nationalistic ideologies that are already running dangerously high.